Disappointment permeate s the Confederacy following General Robert E. Lee’s unsuccessful foray northward. Now back in Virginia following the Battle of Sharpsburg (Antietam), Reuben Allen Pierson of Mount Lebanon, Louisiana is serving as a sergeant in Company C, Ninth Louisiana Infantry in Lee’s Army of Northern Virginia. Mount Lebanon had been established in 1837 primarily by a “colony of wealthy and intelligent Baptists,” many of whom were large slaveholders. Not surprisingly, the Louisiana Baptist Convention was formed in the town in 1848, and the establishment of the Louisiana Baptist newspaper followed. Mount Lebanon remained the center of Baptist activity in the state when the war commenced. 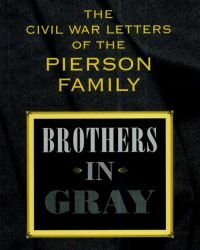 Today Reuben Pierson, well educated, a teacher before the war, and a member of a slaveowning family, writes a letter to his father. The letter reveals a longing for family and offers insight into the disparity that sometimes exists between battlefield reality and the Southern Baptist press. Again I sit down to write home without having received a line from home. I have written as many as seven letters home since I received a letter from any of you all while others are receiving letters daily from Lebanon. Why is it that I receive none? The only answer that [I] can imagine to the question is you are all to busy to write. We have all been stationed in camps around Winchester ever since the battle of Sharpsburg. We marched down on the Potomac once and remained five days, during which time we tore up the track of the Baltimore and Ohio R.R. for more than twenty miles, burned the ties and ruined the iron by bending it across the fires. The enemy seems but little disposed to advance upon us; we are now within a day[‘s] march of Harpers Ferry where the enemy have been stationed for several weeks. They remain within their fortifications not thinking it prudent to attack us. Everything is quiet in camp. Rumors are frequently circulated around that we have been recognized by Belgium but no one believes a word of it. The health of the troops is generally good so far as my knowledge extends. My company with 68 present has nine on the sick list but none of those is confined to bed, mostly complaining from colds. There is still much talk of our being sent back to La. but I have little faith in it myself. But a few weeks will develop what course will be taken in the matter. When I hear I will write home. I have not been paid off since May and the Government is now due me six hundred and fifty ($650) dollars. I expect to receive pay in a few days & will send home a part of the money the first opportunity. If I have chance I will send you 100 pounds of fine tobacco. Tell Jimmy I think by his coming to my company I can get him a position either in the commissary or quartermaster[‘]s department where he will have a horse to ride. Tell sister is she can spare the time to write to me at least once every two weeks. The account given of the daring deeds performed by Capt. John Hodges & myself in the La. Baptist, by someone just returned is utterly false and the author was certainly not there. In the first place Capt. H was absent sick during the whole trip till we crossed into Maryland. 2nd the 9th Regt. not Col. Stafford never refused to charge at any time or place. The author of that story cannot be one of the wounded Blues, but must be someone who generally gets sick about the time the cannons begin to roar…. Only three editions of the Louisiana Baptist survive the war, so the account described by Pierson is unknown.